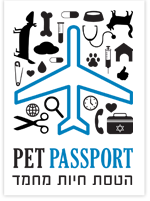 Pet-Passport was established following our experience in accompanying a large number of pet owners and their pets on their travels abroad. During this period we found that the requirements of Israel and many other countries are quite strict and that requires numerous documentations and preflight arrangements, before pets are able to fly with their owners abroad. The numerous requirements, the difficulty in obtaining relevant information and the various approvals that are required caused many pet owners confusion and aggravation. Some had to give up taking their pet with them. Some had difficulty or even complete refusal of entry to the country of their destination. In other cases long periods of quarantine demands for the pets were issued that sometimes even led to death, all due to improper preparation. Our goal at Pet Passport is to simplify the process and make it comfortable and pleasant for you and your best friend. We believe that our know-how and skilled professional team, which includes experienced veterinarians, assistants, travel agents and wide range of in-flight product which are personally fitted for each pet's needs - will help you fly with a peace of mind.